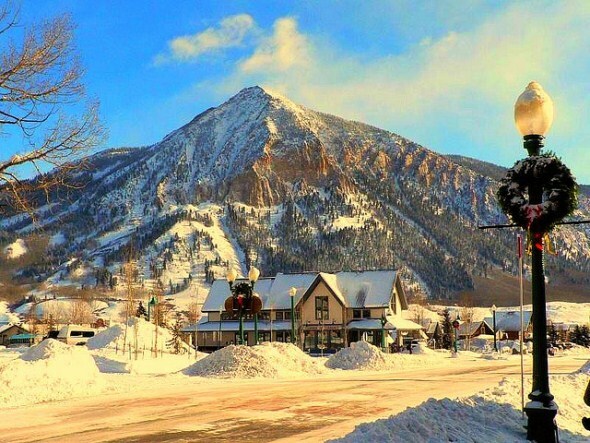 Crested Butte has long gone its own way as a town and a ski resort. The town stands apart because it was built on coal in the 1880s, not on the silver and gold that brought booms to other eventual ski towns in the Colorado Rockies. Today, the town has its share of historic Victorian-era homes and commercial buildings. But the commercial buildings are wooden and one or two stories, without the three-story brick and stone structures found in Aspen and Telluride. And the homes are simpler, without the brick mansions built by mine owners and executives in the other towns. Crested Butte also has remnants of the company town it used to be, in the mine superintendent’s house and the company store that still stand. All that gives Crested Butte’s downtown a human scale that’s friendlier and down-to-earth and the rest of the town looks like a typical, rough-around-the-edges mining and ranching town and feels more like the Old West than a polished-up ski resort town. Indeed, the town still does not have a stop light, and it does have a two-story outhouse behind the former Company Store of the Colorado Fuel and Iron Co. The Crested Butte Mountain Resort north of town remained family-owned long after others went corporate and built a national reputation as a pioneer in extreme skiing and expert, backcountry terrain, which drew a daring and free-spirited crowd while still offering conventional skiing on beginner and intermediate terrain that served families. Also, Crested Butte was always more isolated than other ski resorts in Colorado. It was reached not by heading up the Interstate 70 corridor west of Denver for a couple of hours, but by heading southwest on U.S. 285 and U.S. 50 for five hours. As a result, it pioneered programs that brought out-of-state skiers into Gunnison, less than 30 miles away, on direct flights, instead of having to go through Denver. The ski area, which had fallen behind others due to a lack of capital, is undergoing a renaissance with the investment of $200 million by the resort’s new owners. It also wants to expand onto neighboring Snodgrass Mountain, but that application was rejected by the U.S. Forest Service and the dispute could be heading into federal court. Crested Butte also has built summer business around the wildflowers that cover the hillsides near the ski area and the mountain biking trails that run across the mountains. County: Gunnison (Gunnison is county seat). Altitude: 8,909 feet above sea level.